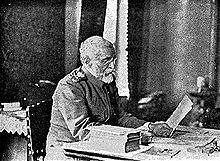 Radomir Putnik, also known as Vojvoda Putnik, (Радомир Путник - Војвода Путник) (24 January 1847 in Kragujevac - 17 May 1917) was a Serbian Field Marshal (vojvoda) and Chief of General Staff in the Balkan Wars and World War I, and took part in all wars that Serbia waged from 1876 to 1917. He became a professor in the Military Academy, holding that position from 1886 to 1895. In 1889 he was appointed Deputy Chief of General Staff. However, he soon came into conflict with King Milan I, partly for not allowing a King's prot�g� to pass an examination. Political intrigue and latent conflict with Kings Milan and his successor, King Alexander I, would follow him throughout this part of his career. In 1895, he was forced to retire and, after an unsuccessful assassination attempt at King Milan in 1899, he left the country for fear of further retaliation. After the military coup d'etat (executed by what would later become unofficially called Black Hand organisation) against Alexander I in 1903, Putnik was rehabilitated, promoted to the rank of General and appointed Chief of General Staff. He proceeded to completely reorganise the army, to retire old and promote new officers, and to update war plans. He appointed General Živojin Mi�ić as his deputy. Despite occasional personality clashes, the two men had deep respect for each other. Putnik was the first officer to be appointed to the highest rank of vojvoda (Field Marshal). In 1912, he led the Serbian Army into victories in the First and Second Balkan War. During that period, he was also Serbian Minister of War on several occasions. The Serbian front remained relatively quiet until Autumn 1915, when Austro-Hungarian, German and Bulgarian forces, led by Field Marshal August von Mackensen, began a large offensive against Serbia with more than 300,000 soldiers. With the Bulgarians attacking from the rear, the Serbs found themselves in a hopeless position. On 25 November, Putnik made his last and most painful order - full retreat, southwards and westwards through Montenegro and into Albania, trying to reach allied ships that would, he hoped, transport the core of the army to the safety of the Ionian islands. The retreat was one of the most tragic events in Serbian history during which the Serbian army lost more than 100,000 soldiers to desertion, starvation, illness, and attacks from enemy forces. Some 125,000 Serbian soldiers reached the Adriatic coast and embarked on French transport ships that carried them to the Greek islands, chiefly Corfu. In worsening health, Putnik had to be carried during the retreat, exhausted by the effort and episodes of bronchitis, influenza and pneumonia. He was taken over by allied forces in Skadar and transported to Brindisi, and then to Corfu along with the core of the army. Troop concentration on paper is a quick and easy matter. Ironic remark in a letter to Andra Knićanin on the movements of the Serbian army across very difficult terrain at the beginning of the Serbo-Turkish war of 1878. Upon first hearing of the Battle of Kumanovo - The Serbian High Command expected that a decisive battle with the Ottoman forces has yet to take place - most likely on Ovče Polje plateau just north of Skopje. Also, due to communication problems, it first heard of the battle when it had already been won.